We're all getuping for comfort when it comes to dressing up, and this combination of a beige trenchcoat and a MICHAEL Michael Kors michl michl kors logo tote bag is a practical example of that. Lift up this look with black suede pumps. Choose a beige trenchcoat and a MICHAEL Michael Kors michl michl kors logo tote bag for a comfy-casual look. You could perhaps get a little creative when it comes to footwear and dress up your look with tan leather heeled sandals. If you're all about feeling relaxed when it comes to dressing up, this combination of a white v-neck t-shirt and a MICHAEL Michael Kors michl michl kors logo tote bag is what you need. When it comes to footwear, this ensemble is finished off wonderfully with tobacco leather flat sandals. 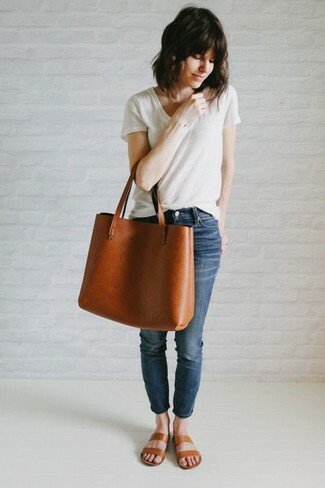 Opt for a light blue sleeveless top and a tobacco leather tote bag for a comfy-casual look. Spruce up your look with grey leather pumps. If you're all about relaxed dressing when it comes to your personal style, you'll love this absolutely chic pairing of a dark brown leather biker jacket and a tobacco leather tote bag. To add oomph to your getup, complete with black suede pumps. If you're obsessed with practicality dressing when it comes to your personal style, you'll love this cute pairing of a tan leopard fur coat and a MICHAEL Michael Kors michl michl kors logo tote bag. When it comes to shoes, this look is round off nicely with tobacco leather lace-up flat boots. We all want comfort when it comes to dressing up, and this combination of a beige crew-neck sweater and a MICHAEL Michael Kors michl michl kors logo tote bag is a great example of that. Bump up the cool of your outfit by finishing off with black suede heeled sandals. Opt for a grey dress shirt and a MICHAEL Michael Kors michl michl kors logo tote bag from farfetch.com if you're in search of an outfit idea for when you want to look casually cool. Grab a pair of hot pink leather heeled sandals to va-va-voom your outfit. 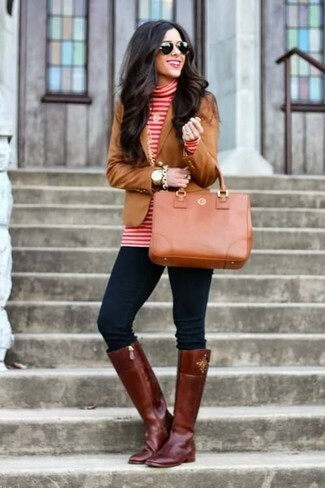 We all want comfort when it comes to dressing up, and this combination of a brown blazer and a MICHAEL Michael Kors michl michl kors logo tote bag is a good illustration of that. Perk up your ensemble with burgundy leather knee high boots.